Couple of years ago, I wrote an article on how to save gasoline by changing some of our driving habits. I have republished the article again with the faint hope that it may help us again. I say “faint hope” because whatever we could have saved has been wiped out by this record price increase. These days I am taking a more philosophical approach towards this disaster, and this resulted in a new play “Baad Protibaad”. Well, don’t be scared, since “Baad Protibaad” is not a philosophical play at all (unless you really try hard to dig out the trace amounts from deep within the characters). It is just a humorous take on the effects of the gas price increase on us, the Bengalees. The word “Gas” has some special connotation to us the Bengalees. But now, it almost means our life blood. And when this important part of our existence in this country is threatened, how do we react? And please remember to come to ECTA’s mini theater festival on June 28th and 29th at the Edison Valley Playhouse, in Edison, NJ. If you like the above play, I am sure you’ll love the plays at the festival. 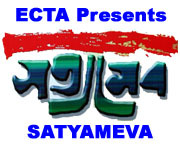 After receiving wide critical acclaim and audience appreciation in Kolkata, New Jersey and Pennsylvania, ECTA offers an encore presentation of “Satyameva”, a play by Sudipta Bhawmik. ECTA (Ethnomedia Center for Theater Arts) presents this new Bengali play (with English SuperTitles) at the Edison Valley Playhouse, in Edison NJ on June 28, 2008 at 3.30pm.